Be the first to share your favorite memory, photo or story of Gilberto. This memorial page is dedicated for family, friends and future generations to celebrate the life of their loved one. 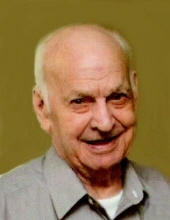 NEW BEDFORD-Gilberto Sousa, 85, of New Bedford, died Monday, April 8, 2019 at St. Luke's Hospital following a lengthy period of declining health. He was the widower of Maria de Lourdes (de Medeiros) Sousa and son of the late Augusto Sousa and Maria da Gloria Froias. Born in Agua de Pau, St. Michael, Azores, Mr. Sousa served in the Portuguese Army and came to this country with his family in 1978. He was a communicant of Our Lady Of Mt. Carmel Church. Mr. Sousa was employed at Gaspar's Linguica until his retirement and previously as a custodian at Berkshire Hathaway. He was an avid fan of the F.C. Porto soccer team and was known for his homemade wine. His family includes 4 sons, Carlos M. Sousa and Paul J. Sousa, both of New Bedford, Gilberto M. Sousa of Dartmouth and Jose R. Sousa of Swansea; 4 daughters, Maria de Lourdes Madeira and Maria Almerinda Sampaio and her husband, Joao, all of New Bedford, Ana P. Sousa of Acushnet and Julieta C. Neves and her husband, Mark of Dartmouth; 1 brother, Eduardo Sousa of Canada; 11 grandchildren, Jose R. Madeira, Jeffrey Sampaio, Stephanie Spurrier, Brian Madeira, Timothy Sampaio, Colton Sousa, Denver Sousa, Jaide Sousa, Karina Neves, Tiago Sousa and Mark Neves, 5 great-grandchildren, Aidan Spurrier, Milana Sampaio, Kennedy Sampaio, Demitri Sampaio and Beatriz Madeira; several nieces and nephews. He was the father of the late Natividade Sousa and brother of the late Joao Carlos Sousa, Manuel Sousa, Maria do Rosario Sousa, Margarida Fuma and Maria de Lurdes Sousa. Visiting hours Wednesday evening 5:00-8:00. His funeral will be conducted Thursday morning 8:00 at the funeral home with a Mass of Christian burial to be celebrated in Our Lady Of Mount Carmel Church at 9:00. Interment in Rural Cemetery. To send flowers or a remembrance gift to the family of Gilberto Sousa, please visit our Tribute Store. "Email Address" would like to share the life celebration of Gilberto Sousa. Click on the "link" to go to share a favorite memory or leave a condolence message for the family.